I'm with you on not making extra trips. My driveway is 30 steps down from the front door of the house, so I carry as much in one trip as humanly possible. ....Let's invent one and really call it "sarcasm"
....Oh the hours I spent as a child practicing! ....Happens more often to me in reverse: when I have been cleaning house, gardening or working out and run to the store, I see EVERYONE I have ever known. 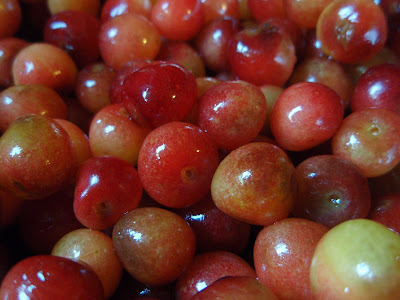 Love tart cherry recipes. I will hint about Ree Drummond's book for my birthday. Love the Pioneer Woman, too. And I don't know how to fold a fitted sheet either. When/If you learn, please teach me. Too funny! I agree with all of it, except i actually do know how to fold a fitted sheet. You have to tuck the corners into each other as you fold. Then fold the corners over before folding the whole thing. Got it? Certainly pitting cherries is a chore worth doing! Delicious cobbler. And, for the life of me, I have never been able to fold a fitted sheet. -Ignore them and hope they'll go away. LOL, yes to the majority of those and thanks for the idea of adding in the unwanted callers' phone numbers.....GENIUS! I finally watched a Martha Stewart youtube video and learned how to fold a fitted sheet. Your cherry dessert looks fantastic. but well worth it, I guess, depends on the hunger level at the time. my hubby HATES when he talks to me and I say 'what' 4 times before he grunts off. I get him everytime for that--do I love it? Hell yes. LMAO!! yes and yes and yes to all except I do know how to fold a fitted sheet but I had to be taught by an old "mentor" lady not all that long ago. Prior to that is was rolled up and smashed to look like a fold was attempted. I follow Julia's steps for folding the fitted sheets... my mom was a pro! I've never had the patience to pit cherries. So glad to hear I'm not alone with asking "What?" and keeping phone numbers in the cell so I don't answer! I am so with you on the grocery bags. I come in with rng mark indentations on my arms running all the way up, just so I dont have to make extra trips..go figure..
What? hehe, I say that alot! And I always load myself up with the grocery bags.Then I have trouble getting through the door. 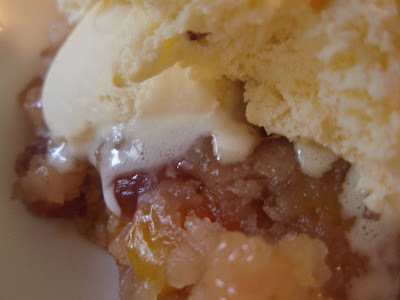 I love the gooey cobbler; it's making me want to lick the screen! I'm with you on over half of those! Especially the cursive one; I haven't used it since third grade. Lovely cobbler - looks yummy! Haha I agree wiht so mnay of those. I also found most of Maths during school rather useless! I'm yet to use 80% of it! Mmm I don't think I've ever worked with fresh cherries before. Yes, yes, yes! I completely agree with you on everything! I love the part about blocking the jerk driver. It seems like everyone's driving abilities are getting worse and worse. Waw,..;the cobbler just looks divine, Grace!! I think we all totally do those things! Great cobbler. I'm with you all the way, except I do know how to fold a fitted sheet, but I choose not to waste my time doing it. Oh my God- your list is so funny because it is so true. I had to laugh through most of that! Why are there no cherries in my house?! I kind of ned this now. I can definately relate to some of the stuff you said! You have to watch Martha Stewart fold a fitted sheet...it's perfect. haha I loved your post! I agree completely with your list. I haven't used cursive since the 5th grade and ALWAYS run into people I don't want to see when I'm having a bad hair day and wearing some sloppy outfit ...aarrrrgg:)Great looking cobbler btw! Do you know that unpitted cherry actually taste better? So, I never pitted mine. Pitting cherries is such a pain but so worth it. This looks amazing. I've never pitted cherries. This is yum. This is so nice! Your dessert looks so delish! Oh Grace, I so love you! I can look at a clock a hundred times and still forget what time it's supposed to be. BUT, I just learnt how to fold a fitted sheet this year, can't say you're missing anything:) So happy that our cherry season has finally arrived, I can look at recipes like this and go YUP! We do need a sarcasm font...I use italics but it just doesn't seem snarky enough. And I have NO freaking clue how to fold a fitted sheet. It makes me batshit crazy. You are damm funny, you had me laughing out loud. I am so glad I am not the only one with quirks! You are too funny! I make my hubs fold the sheets and make the bed. He is very particular about it so he can do it..ha! I have to admit it, I can fold a fitted sheet. My one claim to fame. Not really, but I'm with you on the rest. That is ONE of the banes of my existence. Sheesh. My mom always made one of us help her fold them and hers always looked perfect. I guess it takes two! And WHERE did you find those cherries? They're so long gone from around here it's sad. Or makes a huge list for the grocery store and leaves it on the counter then has to call hubby and realizes the phone is with the list. I think we are made from the same cloth Miss Grace! Mmmmm. This looks so good, I wish I could have some for dessert tonight. Your questions crack me up. I need to remember the phone number trick. I can't fold a fitted sheet to save my life - ugh! I had the pleasure of meeting Ree at BlogHer, she really is all that and I am sure her recipe is fantastic. I think I answered yes to almost all of those...especially the one about jerks cutting in a line of cars. That happens to me about 3 times a day (maybe even 3 times each way to work) and nothing makes me angrier than when I actually let them in and they can't be bothered to wave. LOL I pretty much do/agree with all of those things! And there's nothing wrong with picking the easier recipe. We all have busy lives, after all!